Whew, what a whirlwind! I think I'm still recovering from it all. 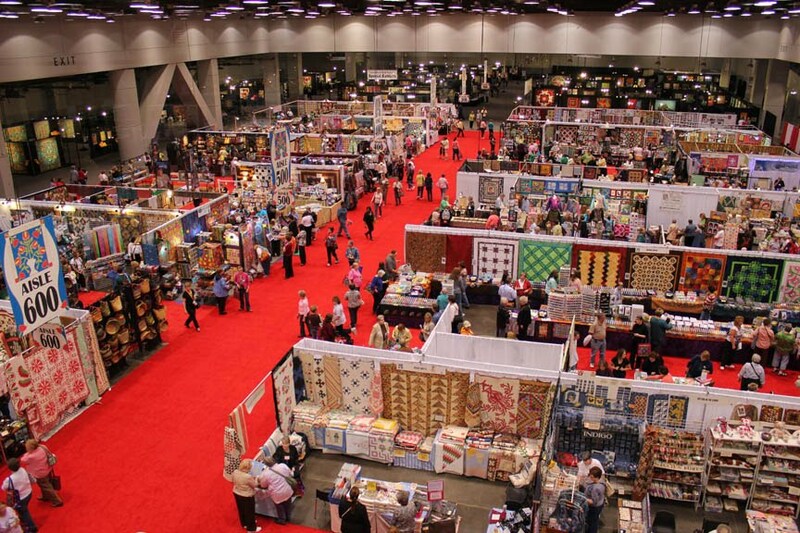 The International Quilt Festival was held in my hometown of Cincinnati this weekend, and it was a great time. 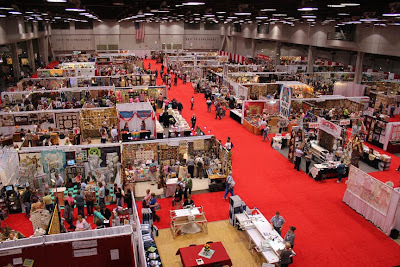 The show was huge, with aisle after aisle of vendors selling notions, fabric, machines and everything in between. 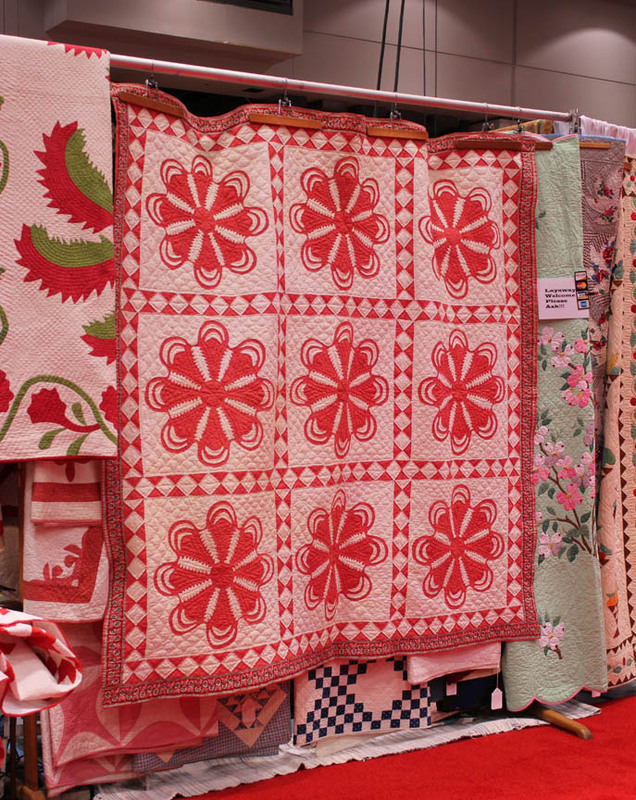 Some of my favorites were antique quilts like this gorgeous red and white one. And these handmade baskets from a women's co-op in Ghana were amazing. 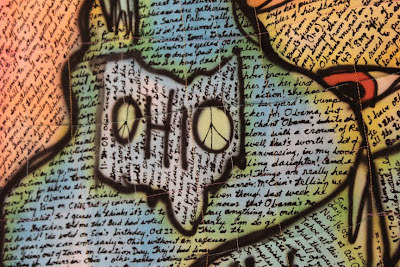 I was really intrigued by the work of Susan Shie, an Ohio quilter, who had a special exhibition at Quilt Festival. Her most recent work features simple quilting and hundreds (if not thousands) of hand written words across the fabric. 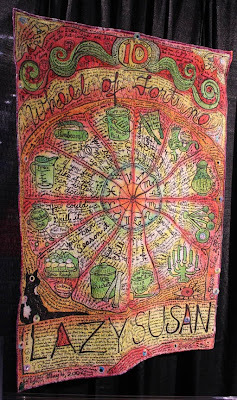 I especially loved this detail in one of her quilts. It was so great to hang out with my friend Pat Sloan. 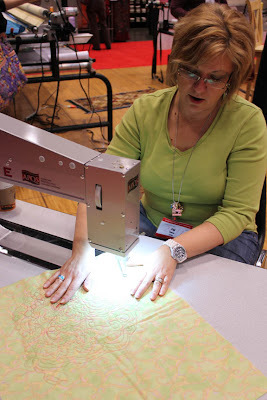 She was kind enough to show me the ropes on her George Quilting Machine by APQS. I knew as soon as I tried it that I'd want one for myself. Maybe someday--a girl can dream, right? 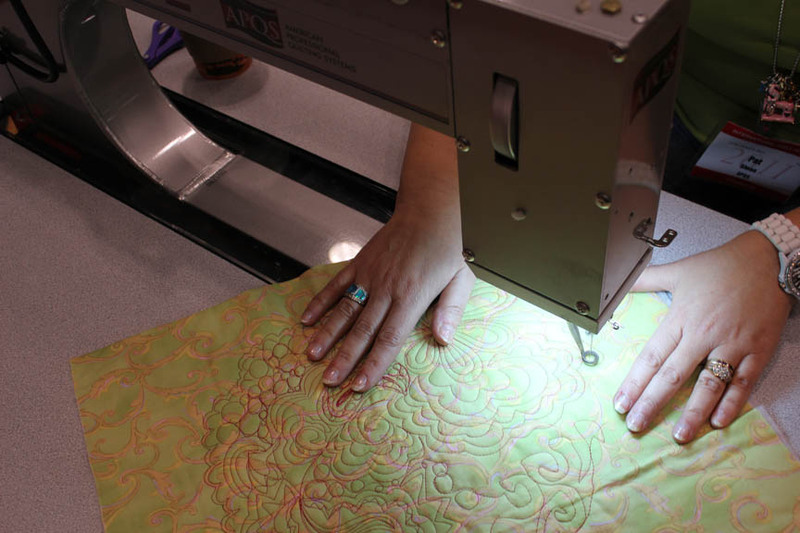 Can you even imagine how quickly you could finish quilts with that guy! Look how beautiful Pat's stitching is! She is just amazing. 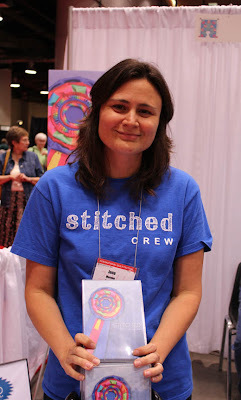 I also attended the world premier of the documentary Stitched, which tells the story of three art quilters as they prepare their entries for the show at the International Quilt Festival in Houston. 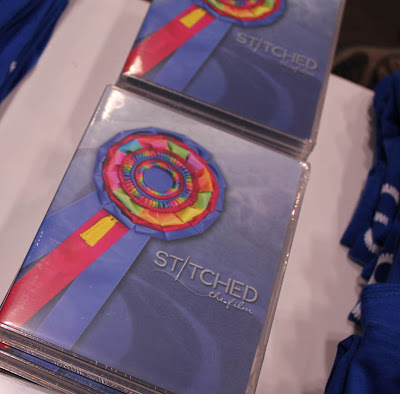 Stitched is truly a great film, and I honestly think it will appeal to both quilters and non-quilters alike. I spent some time speaking with the filmmaker Jenalia Moreno and was amazed to find out that Stitched is her first film. I bought a copy of the movie and I encourage you to do so as well. Also, if you're in the Houston area, Stitched will be shown at the Museum of Fine Arts Houston on June 1 and 2. 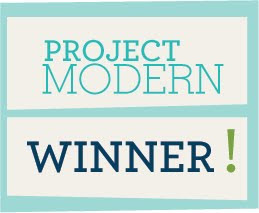 The film also just won a Houston Arts Alliance grant--I'm telling you, you need to keep your eyes out for Jena because I think she's definitely one to watch. But the most exciting thing that occurred all weekend just happened to fall on my birthday. I was interviewed by Pokey Bolton for Quilting Arts TV to talk about the Cincinnati Modern Quilt Guild and modern quilting in general. Can you believe it? Pokey assured me that the interview went well, but I really hope she's got some footage she can use for the show because I was a nervous wreck! 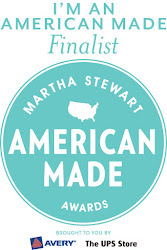 My segment should air sometime later this year, and I'll let you know the exact date as soon as I can. 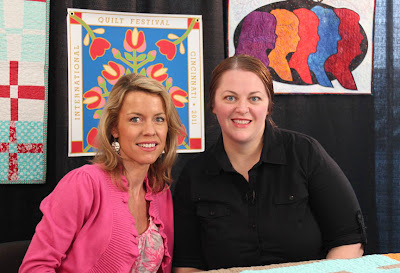 It was so cool to talk with her about my work! 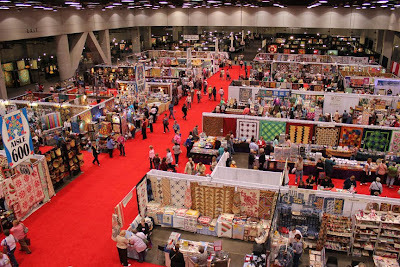 I can't wait to see what is in store when the International Quilt Festival returns to Cincinnati April 13-15, 2012. Oh my gosh! That is awesome!!!! I wish I knew Pat Sloan was there--I would have introduced myself (she just interviewed me for her radio show). 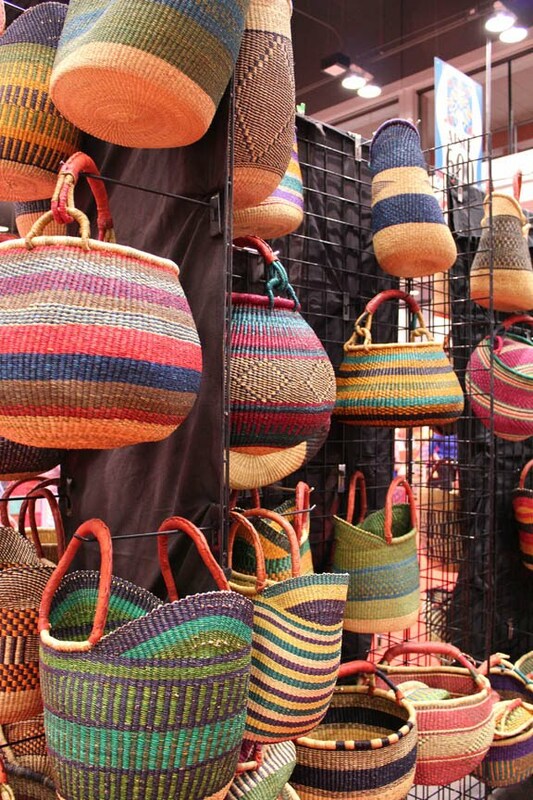 I was there on Sat for just a few hours. Whirlwind is right! I was so inspired by all the amazing quilts. Congrats on your TV segment! My favorite booth was the one near the main entrance--an older couple who sold TONS of vintage buttons and vintage fabric. Love, love, love. Great show! 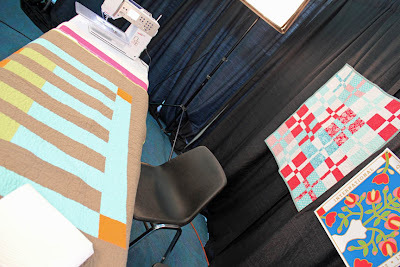 I'm hoping to get a post up about it in the next day or so! Sounds like you had an awesome time! 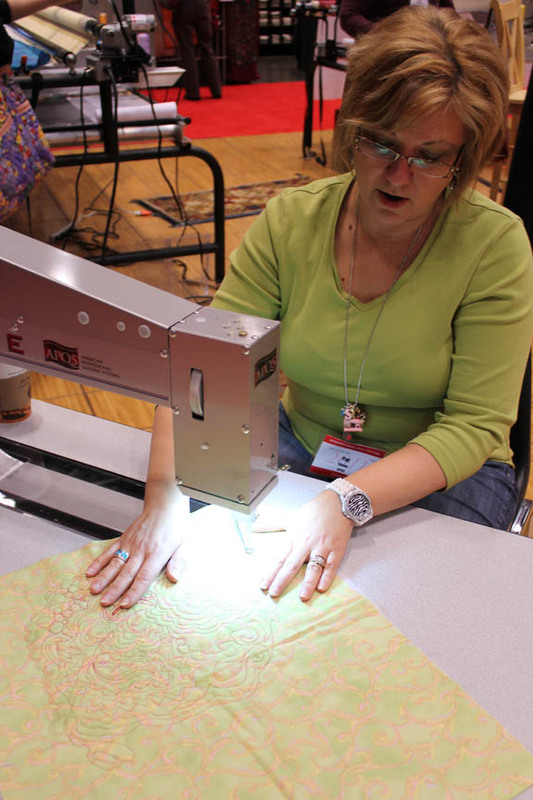 Congrats on the TV quilting segment, that is so exciting! The film sounds very interesting also. Thanks for the information on that.